Devon and her mum were invited to the opening of a dog grooming salon/school on Thursday. Here is how she got on. 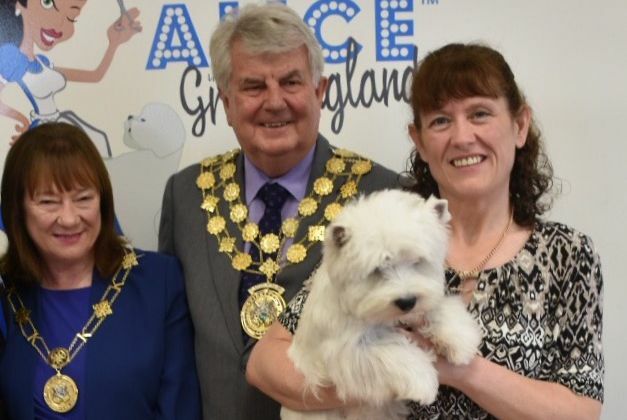 “Me and my mummy were invited to a special opening of a top new Grooming Salon called Alice in Grooming Land! Everyone was really friendly and I even got to meet the Lord Mayor of Huddersfield and his lovely wife. There were lots of yummy treats and I got very spoilt with lots of cuddles and attention. I think the big smile on mummy’s face shows she enjoyed herself too! I would like to receive your newsletters and other marketing materials that might be of interest to me. © 2019 Wafcol. All rights reserved.